This article is about the Grand Order raid. For the summon stone, see Grand Order. For the character, see Zooey. Grand Order is one of two Rank 80 raids. She is summoned from the northern Zinkenstill area, Azure Sky Sanctum. You can join Grand Order raids at Rank 50. This raid is the primary source for Azure Feathers which are traded for Heavenly Horns, which are in turn traded for Silver Centrums and Cosmos Weapons. 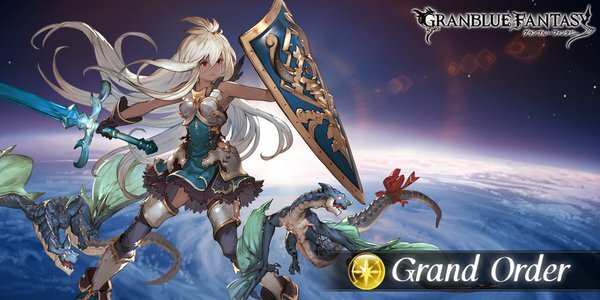 Summoning Grand Order requires one of each Omega Anima from Twin Elements, Macula Marius, Medusa, Nezha, Apollo, and Dark Angel Olivia. Combine them in the shop to first create Bright Spirits and Murky Spirits which can then be traded in for a Peacemaker Star. Location: Chapter : Zinkenstill - Azure Sky Sanctum Start QuestNetwork Errors will appear if the hosting conditions are not met. Plain damage to one ally. Light damage to all allies. 9,999,999 Light damage to all allies. Sets the HP of all allies to 1. All ally skills have their cooldown timers randomized. Inflicts Wormhole (1 turn) on all allies. Does 500,000 plain damage to Wyvern Orders. Dispels ​ on all Wyvern Orders. Only Grand Order must be defeated to clear the raid. Conjunction can't set a cooldown higher than its cooldown timer. Wormhole inflicts a random debuff when it expires. 20 hits of small Water damage to random allies. 3 hits of small Water damage to random allies. Small Light damage to all allies. Warning! Does not work for Plain Damage!. Cannot be dispelled. Warning! Does not work for Plain Damage!Verification needed. .
20 hits of small Fire damage to random allies. Small Light damage to all allies. Dispels all ally buffs. Drop table last updated: 2019-03-10, all stated drop rates are estimates. This page was last modified on 1 June 2018, at 17:09.